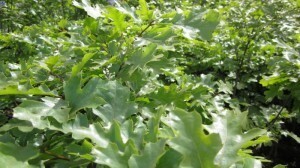 Habit: large deciduous tree with a broad rounded crown with lower branches nearly touching the ground, growing slowly until fully established. May occur as a shrub at higher elevations and poor sites. Mature bark is dark brown to black appearing furrowed into small irregular squares. 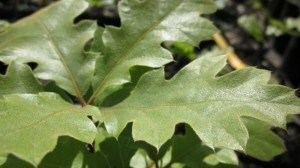 The bright green leaves are deeply lobed into 7-10 pointed to rounded lobes with a small bristle on the end of each tooth. the tree gives almost year round color with the emerging leaves having a pinkish red color, becoming dark green in the summer and finally turning to yellow orange in the fall. Flowers are inconspicuous and fruit is an acorn, which takes two years to mature. 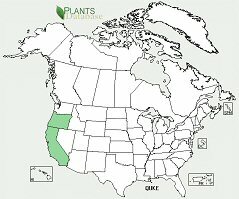 Ecology: found in forested dry foothills, oak woodlands and mixed evergreen forests from Central Oregon south throughout California in elevations from 3000-8000 ft (900-2500 m). Growing Conditions: full sun to partial shade, moist to dry soil, requiring summer water in dry locations. Drought resistant. 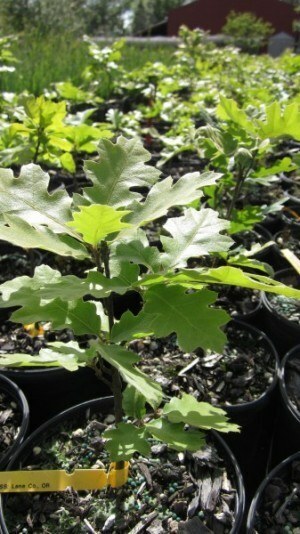 Provides a food source, mainly the acorn, to a variety of wildlife, including birds, bear, ground squirrel and deer.